The non-slip composite decking boards are designed to last, with the added protective UV-layer it will shield your boards from the elements to look amazing all year round. Easily resize the boards and make your dreams a reality. 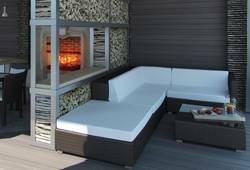 Use your imagination and simply cut the composite decking to the exact size you need to bring your designs to life. ​​​​​​​The unique panelling allows endless design possibilities​​​​​​​. Simply choose between the reversible panels, to always create flawless layouts.